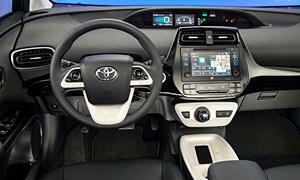 Need advice about a specific Toyota Prius problem? Chart based on 17 repairs. See TSBs and recalls for the 2016 Toyota Prius. 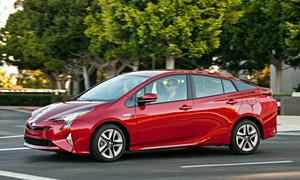 See repairs for all Toyota Prius model years. 25000 mi Shock on the rear driver's side was loose and rattling. Dealer tightened it after we pointed it out when we took it in for routine oil change. Fixed the issue. US $76 No repair just regular check up. 24000 mi Headlights were always out of adjustment and oncoming traffic often flashed their high beams at me. 35500 mi Dead battery. Would not hold charge. Battery replaced under warranty (no cost to owner). 23000 mi When applying brakes, ticking sound could be heard from front end. When applying brakes and going over bump/pot hole ABS system unsafely disengages brakes. 25000 mi Under light braking clicking noise coming from drivetrain. Dealer states could not duplicate but problem persists. 4700 mi Rattle in dash finally fixed after multiple attempts. There is no recall on it, or service bulliten, but there is an issue with some 2016 Prius with the rattle. While in for the problem I googled it and shared the results with the technician. He removed the part to see if the rattle went away, which it did, and ordered a vent part. Once a new one was installed the problem was solved. US $1000 Windshield cracked because of heat. Noticed tiny crack in the windshield, which grew into a foot-long crack. Seems like a defect because many other Prius drivers have reported windshield issues/cracking not involving rocks or accidents. 5000 mi Dead Speaker, connector repaired. See our lemon odds and nada odds page to see vehicles with no repairs or vehicles with more than three repairs. To see how frequently 2016 Toyota Prius problems occur, check out our car reliability stats.